Fought on March 15, 3019 (TA), the Battle of the Pelennor Fields was the greatest battle of the War of the Ring and the Third Age, fought between the armies of Sauron and the forces of Minas Tirith. On March 10, the Dawnless Day, Sauron had sent forth a great mass of dark and foul clouds over Gondor, invoking uncertainty and dread in his enemies and easing the movement of his armies. It was at this time that Frodo and Sam passed through Minas Morgul, where they saw the Witch-King of Angmar depart from the city on a black horse. Faramir had sent reinforcements to the garrison at Osgiliath on March 9, expecting an attack from the enemy. On March 11, he left to command the garrison; they were attacked that night, and Faramir retreated to the Causeway Forts the following day. Doing his best to hold the rearguard, he was wounded by a foul arrow of the enemy on his way back to Minas Tirith. With Denethor, the Steward, refusing to leave his son’s side, Gandalf took over command of the city’s defences, and on March 13 the Siege of Gondor began. Led by the Lord of the Nazgûl, Sauron’s army (consisting of 30,000 Haradrim and a large number of Easterlings, Variags, and Orcs) attacked Minas Tirith. Though the Lord of the Nazgûl broke down the Great Gate of Minas Tirith (see: Grond), the unexpected arrival of the Rohirrim (6,000 in number) prevented him from entering the city any further. While the Rohirrim were able to force the Haradrim cavalry into a retreat, the Witch-King appeared and scattered the Rohirrim and mortally wounded King Théoden, who was crushed by his horse; in turn, the Lord of the Nazgûl was slain by Éowyn and Merry. Under the command of Éomer, the Rohirrim continued their assault while the Footmen of Gondor launched a counterattack of their own. 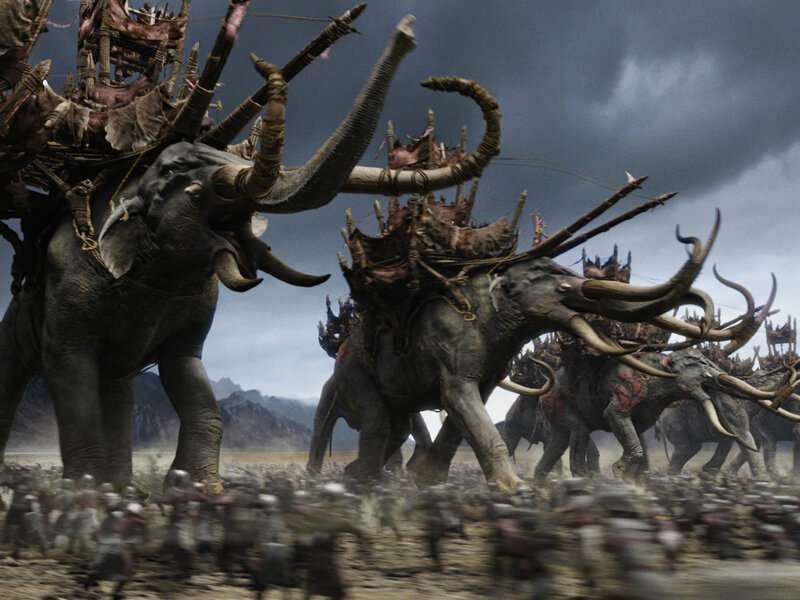 But they were outnumbered by the Mumakil, Haradrim, and Southrons, and the enemy had quickly recovered from the loss of its commander. Even more terrifying to the Men of the West was the arrival of the ships of Umbar. But unbeknownst to either side, Aragorn and the Army of the Dead had vanquished the corsairs; upon their arrival, they found themselves in a very advantageous position. The Men of Gondor and Rohan were able to use this to their advantage as well, and most of the Mordor-host was slain (the rest fled back toward the Land of Shadow). By sunset the battle had ended, and both armies had suffered considerable losses.